The Wisconsin Citizens Media Cooperative formed as a response to the lack of information – and the presence of misinformation – about the critical issues of our time, beginning with the assault on constitutional rights by the Scott Walker administration within and around the Wisconsin State Capitol. 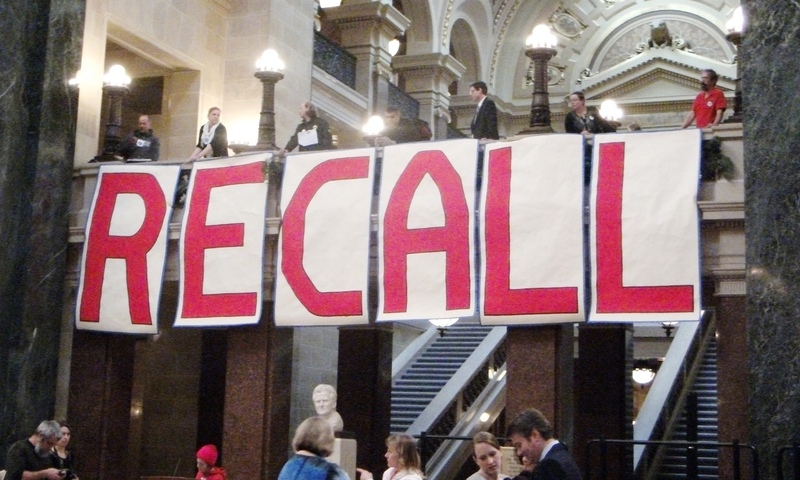 Recall Walker banner displayed in the Capitol rotunda in December. Since the Coop’s inception in January, 2012, WCMC reporters have investigated the stories behind the stories on issues ranging from mining and consumer protection to unconstitutional arrests and intimidation of activists and the stripping away of rights of women, workers and veterans. Many of these stories were not covered by the corporate media at all, or covered in a manner exhibiting the biases and vested interests of their corporate owners and the intellectually shallow or incurious attitude of the professional press. We too have biases, and these biases and points of view compel us to put in hours of unpaid labor to inform the citizens of Wisconsin about the issues and events that concern us so deeply. We do not strive toward some unreachable standard of objectivity in our reporting, but we do try to be transparent and open about our points of view. We welcome discussion and debate and offer a platform for a multitude of different voices. 1) Democracy is not a spectator sport with participation limited to the voting booth on election day. It is the responsibility of citizens to engage directly with their government on issues of concern to them through public hearings, communicating with their elected representatives, watching their government in action during floor periods, and, if necessary, demonstrating their points of view through direct action if their voices aren’t otherwise being heard. 2) Money in politics and the stranglehold of the two-party system has corrupted our political system to such an extent that it is extremely difficult for citizens to engage meaningfully in politics without being wealthy, having the backing of moneyed interests or wielding influence within one of the two parties, which usually requires money or sponsorship of someone with money or influence. 3) It is the responsibility of the media to inform the public about matters of interest and concern to them, but the corporate media only cover a small fraction of what we would consider important stories, and they are covered largely from the points of view of the power brokers. As citizen journalists, we strive to cover stories from the points of view of the people who are most affected by events and policies first. 4) Organized movements of people fighting to defend and expand human and civil rights are just as newsworthy as the actions of people holding elected office. As the condensed recall election cycle heats up throughout the month of May, we will be covering the elections and the campaigns in light of these points of view. We fully support the recall of Scott Walker, Rebecca Kleefisch and the four Republican senators given their unprecedented attacks on the rights and livelihoods of Wisconsin families over the past year and a half. However, we will not be blindly endorsing or supporting any Democratic Party candidate. We don’t see the division in these electoral races as necessarily partisan ones. A bigger divide exists between those candidates who are backed by PAC money and national and state party organizations and those who are running grassroots campaigns. Big money and party candidates already have an undue amount of access to media through high-priced advertisements, specially commissioned polls, billboards and mentions in the corporate press. We will do our small part to balance this out by highlighting the campaigns of candidates who are not accepting PAC money and who are organizing at the grassroots, regardless of party affiliation or lack thereof. Excellent exposition on the underlying principles and purposes of WCMC. Thanks so much for this. The need has again been demonstrated by the total lack of even passing mention of the rally to stop the War on Women this past Saturday. I talked to a reporter & photographer who came to the Occupy Madison rally at the City-County Building this afternoon, and mentioned many people noticing the blackout on coverage. The photog’s lame excuse was that the Crazylegs Run was also on and they are short staffed. Also that Madison Newspapers sponsors the run. I mentioned that I saw eight of our coop citizen reporters at the rally and that attacks on 52% of everybody rated higher than a fundraiser run in my book, so “staffing issues” didn’t really cut it.